Look around your seat. How long does it take you to spot something metal? Perhaps the metal is the seat itself. Welcome to a welder’s world. That’s among the reasons welding is a fertile field for jobs, particularly in Hampton Roads. Tidewater Community College students pursuing a career in welding have the option of completing several tracks of study. The most intensive is a 33-credit certificate in welding that includes classes in English and math in addition to the hands-on training the program offers. Another alternative is the 26-credit career studies certificate focusing solely on the field with classes that range from Oxyfuel Welding and Cutting to Pipe and Tube Welding. 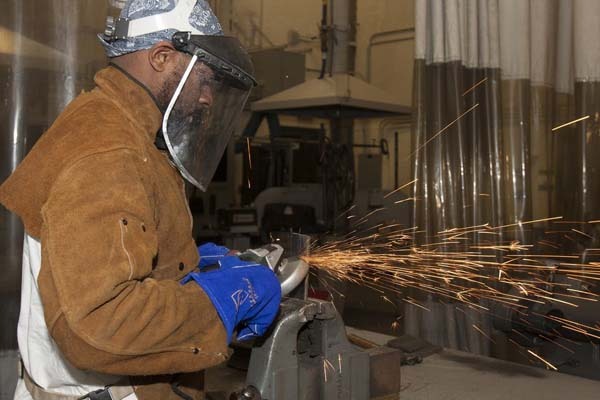 Finally, TCC offers a 19-credit certificate that prepares students for entry-level position as maritime welders. “Generally in this area, welders are always needed,” Mims said. Salaries can be as high as $44,000 a year, but on average an entry-level employee can expect to make between $14 and $16 per hour. The TCC program is 10 percent theory, 90 percent application, Mims said. It’s helpful for incoming students to have a moderate level of manual dexterity and average mechanical aptitude, but a student with the right attitude – even one who can’t change the oil in the car – can still succeed. “It helps to be detail-oriented and have the ability to concentrate for long periods of time,” said assistant professor Walter “Lee” Duke, who spent 32 years as a welder at International Paper before the Franklin mill downsized in 2009. That makes women ideal candidates, Duke said, and companies are often seeking female workers who excel in the nontraditional field. Ten percent of the students in the TCC program, which averages 400 students per semester, are female. Once students graduate, they must pass certification, which is employer-specific. TCC students come in well-prepared for the exam, Mims said, and often employers, including Newport News Shipbuilding, sends employees back to the college for recertification. 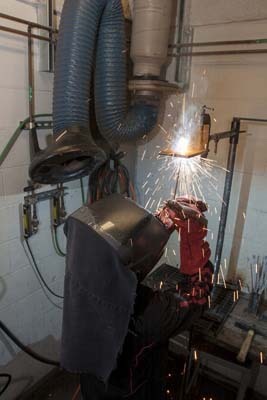 While welding has evolved somewhat due to technology – computers have eliminated much of what used to be human error – basic skills are still essential. Mims – who earned his associate degree from TCC in 2005 — worked as a welder at Newport News Shipyard for 13 years prior to coming to the college in 1996. Duke is a graduate of Roanoke-Chowan College with a background in boilers, pressure vessels, piping, maintenance and repair. His credentials from the American Welding Society include Certified Welding Inspector and Certified Welding Educator. Both men enjoy the field as much as ever. Teaching that art remains something both men are passionate about as well.